Even with Toyota Motor Corp. and startup Nikola Motor Co. moving forward with plans to get hydrogen fuel cell heavy-duty trucks on the road, many hurdles lay ahead before the freight industry can swap diesel fueled fleets for the zero-emissions cargo carriers. Hydrogen fuel cell powered trucks have emerged as the best bet to help meet the goals of California and other regions to slash diesel emissions and pollution, according to the California Hydrogen Business Council. “The industry is demonstrating the technology, establishing the infrastructure and working on the business case to make it as economic as possible to not only build but operate these trucks,” said Cory Shumaker, development specialist at the hydrogen council. On Monday, Toyota said it had built a second prototype semi-tractor that will use passenger car fuel cell technology to haul freight in Southern California. 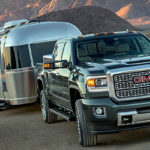 The truck is lighter than its predecessor unveiled last year and can travel 50 percent farther — 300 miles — before it needs to be refueled, the automaker said. In May, beer giant Anheuser-Busch said it planned to purchase up to 800 of Nikola’s planned semi-trucks in the largest single deal on record for heavy-duty delivery trucks powered by hydrogen fuel cells. Anheuser-Busch plans to replace its entire dedicated long-haul truck fleet in the U.S. with zero-emission vehicles. Hydrogen powered fuel cells emit water vapor. 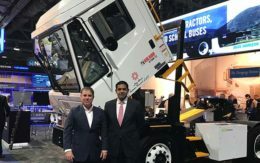 And they deliver the fast refueling, long ranges and good performance under high-demand drive cycles critical to heavy-duty freight trucks, according to advocates of the technology. Challenges in perfecting the technology, finding the financing and building the infrastructure must be solved before fuel cells are ready for wide adoption. At least two more years of testing and significant investment are needed before volume production of the fuel cell trucks can occur, Brian Lindgren, research and development manager of Paccar’s Kenworth Truck Co., said at an April workshop on which the California Hydrogen Business Council report is based. Issues include how to route thick high-voltage cables to maintain a truck’s turning radius, Lindgren said. But as the Toyota announcement proves, the technology is moving forward. Toyota uses a Kenworth chassis on its prototype vehicles. Total Transportation Services Inc. last month took delivery of a hydrogen fuel cell demonstration truck from US Hybrid Corp., said Tony Williamson, TTSI’s director of compliance and sustainability. 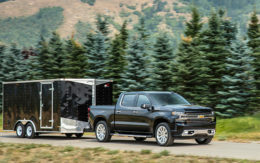 The Rancho Dominguez, Calif., company is testing a TransPower fuel cell truck, trying to hit targets of 442 horsepower and a range of 150 miles. In all, Total Transportation will test eight Class 8 trucks from various manufacturers. Meanwhile, new government funding sources for hydrogen freight are becoming available. The Volkswagen Environmental Mitigation Trust set aside money for heavy-duty trucks and port applications to help with the high cost of early adoption. Investors want to leverage these funding sources with new federal Opportunity Zones to build the refueling stations and other fuel cell infrastructure projects, said Andrew Bermingham, a principal at Hydrogen Partners, a Denver-based financing group. The freight and logistics industry is being pushed to find cleaner fuel as California and others adopt strict emissions standards. Southern California is dogged by the nation’s worst ozone levels and the fifth-highest levels of particulate matter pollution, according to the council. Diesel, which powers most freight trucks, is a heavy contributor to air pollution. In Southern California, that pollution is concentrated at and around the ports of Los Angeles and Long Beach. The smog is heaviest along the freeway freight corridors that often run through low-income neighborhoods. Trucking companies often pick up freight at the ports, then drive the same freeway to an inland railroad freight terminal to unload before driving back for another load. Communities along those routes pay a disproportionate health price for the region’s commerce, health officials said. Fuel cells are a healthier alternative to diesel because they produce electricity without burning fuel and they emit no vehicle emissions. Depending on how the hydrogen is produced, it can be a low- or zero-emission fuel. Eventually, fuel cell trucks could require less maintenance then diesel trucks, industry backers say.